No More Holiday Kitchen Emergencies! Nothing says “Thanksgiving” like a home-cooked meal for all your friends and family. But nothing says “stress” like a cluttered kitchen, especially when you’re trying to cook for all your friends and family! 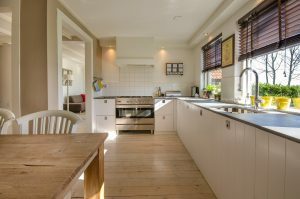 Before the holidays kick into gear, clean out and organize your kitchen by following these steps from Mr. Junk. Tackle the Fridge! Are you ignoring all that expired cheese and the leftovers from last month? Stop ignoring them and get rid of them. Clearing space will clear your mind and make shopping and meal prep easier. Fix the Pantry! Do the same thing with your pantry. Don’t forget those darker corners that you haven’t really looked at in years–they are hot spots for critters! Declutter! Yes, you’re having friends over soon, but how many mugs, place settings, and pieces of silverware do you really need? Be honest with yourself, and get rid of what you don’t use. The Junk Drawer. Don’t panic–you can take this in stages if you need to. Get rid of all the old receipts one day, bundle up all the rubber bands the next, organize the batteries the day after that. It will be easier to actually find things once you can see them. Set up your at-home recycling, call Mr. Junk to haul away your unnecessary stuff, and you’ll be good to go. Enjoy your holidays in a clean, clutter-free environment.